The gate to Her Majesty's Prison, Grand Turk. 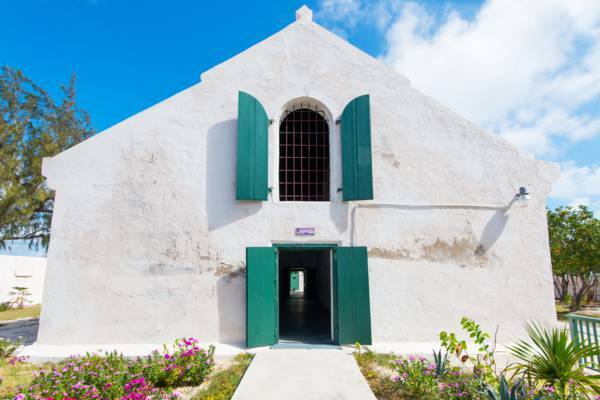 This restored colonial prison offers a fascinating look into the past of the Turks and Caicos and is a great stop for those interested in history. The main cell block at the Grand Turk Prison. Her Majesty’s Prison is a small colonial prison in old Cockburn Town on Grand Turk. This waterfront complex was built in the 1830s (the exact date is not known), and operated as the nation’s only prison until 1994. Today, the site is a historical tourist attraction. There were several expansions to the prison over its life to increase capacity. In the initial years, there were on average between two and six prisoners at any given time, mostly incarcerated for drunkenness and other petty offences. By its closure in 1994, the inmate number had increased to an average of between 50 and 60. The Her Majesty’s Prison had both men’s and women’s wards. Prisoners were served three meals a day, and given 12 hours rest. Work was also occasionally expected of prisoners, such as cracking rocks with hammers for road use or supervised clean-up and maintenance around the town. When a hurricane was approaching, it was a common practice for prisoners who had committed non-serious offences to be released to tend to their families, homes and livestock. The prison experienced one major event that resulted in mass escapes. The disastrous hurricane of September 30, 1866, which destroyed 871 homes and severely damaged another 197, tore the roof off the prison and damaged the exterior stone walls. All boats in the harbour were destroyed, and 16 people on Grand Turk lost their lives (along with 4 on nearby Salt Cay). 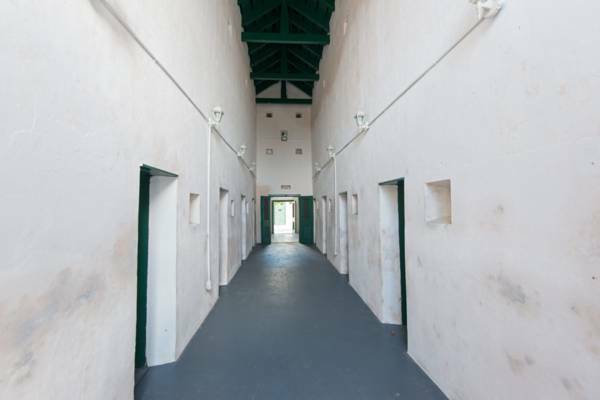 The Main Hall at Her Majesty's Prison, Grand Turk. Broken glass, an early form of razor wire, was added to the top of the walls to prevent people climbing over. Up until the 1960s, there were few successful escapes, largely due to the fact that the prisoners were locals, and there was simply nowhere for them to disappear to in the limited populations of the islands. One of the first successful escapes occurred in the 1860s, when a prisoner called Julius Caesar escaped to the Dominican Republic with a group of four other inmates. During the 1970s and 1980s, drug trafficking became a major issue in the Caribbean. Because the Turks and Caicos Islands are located roughly halfway between Columbia and Florida, and due to the limited development in the Turks and Caicos at the time, the country was favoured as a refuelling stop for drug traffickers. Aircraft and boats ferrying narcotics would land to refuel on the lesser-populated islands, occasionally leading to firefights with the police. During these years the prison population swelled, as well the government’s collection of seized vessels. A large reason for the unsuccessful escapes is due to the small size of Grand Turk at only 6 sq mi. It’s not possible to swim to any other nearby island, and thus escapees had to have well-coordinated plans and a ‘man on the outside’. 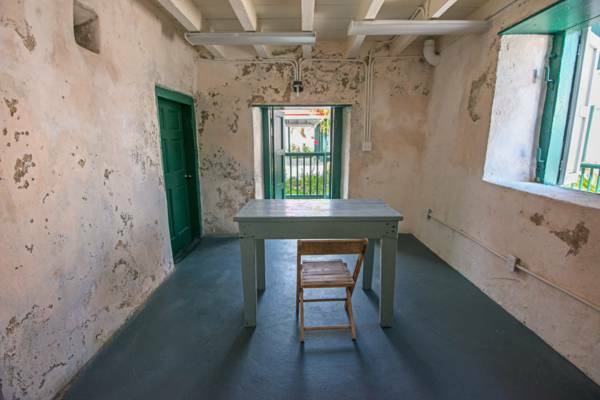 Room at Her Majesty's Prison, Grand Turk. A notable feature of the prison is the Bell Tower, which was rung five times each day (except Sunday). It was rung at sunrise to announce the start of the work day and at sunset to mark the end. Her Majesty’s Prison is typically open whenever a cruise ship is in port. Adult admission is $7. Tours are self-guided, and there are many informational signs around to identify features. Last reviewed by an editor on 13 June 2017.